superdumb supervillain: Kellogg's Keeps You Regular! I recently received some samples from Kellogg's All-Bran and Special K lines. These products are intended to aid in, umm, regularity by boosting your fiber intake. The added protein and fiber takes the edge off of hunger, so you can use them to aid in whatever diet plan you're using. Kellogg's™ All-Bran™ Fiber Drink Mix Iced Tea (also in Pink Lemonade flavor) comes in a box with 10 packets that are easy to toss into your purse or diaper bag. They suggest mixing these into a 16.9 fl. oz. bottled water or, for a lighter flavor, a 20 fl. oz. bottled water. I added them to my 24 fl. oz Camelbak bottle and the flavor was still tasty, even diluted with ice. Each packet of mix contains only 20 calories but 10 g of fiber. And it doesn't taste gritty at all, which surprised me. 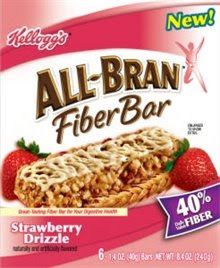 Kellogg's ® All-Bran® Fiber Bar Strawberry Drizzle (also available in Apple Cinnamon Streusel flavor) are Multi-Grain and Psyllium High Fiber Snack Bars. Each bar has just 120 calories but a whopping 10g of fiber and 2g of protein. I preferred the strawberry flavor which actually tasted pretty luscious and decadent for a granola-type bar. They really fill you up so they make an ideal "whoops, I forgot breakfast" plan for moms on the go. Kellogg's™ Special K2O® Protein Water Mixed Berry (also available in Strawberry Kiwi, Lemon Twist and Tropical Blend) is a "refreshing drink that helps you stay on track." It has 50 calories, 5 g of fiber and 5 g of protein per bottle. And it is absolutely delicious. I could probably drink a couple of these in a row, but that would be a big, big mistake…these are NOT Snapple and you would likely be stuck in a bathroom for a long while if you sucked more than one down. All in all, I think these are a way more pleasant way to get fiber than the nasty powder I remember my grandparents stirring into their OJ in the morning. The one problem I have with these is that they don't look drastically different than other Kellogg's items that you might have in the pantry, so the chance of overconsuming, or of kids getting ahold of them, is fairly high. Make sure they know this stuff is NOT for them! How did you get these samples? I've been waiting what seems like forever for Kellogg's to come out with the new All-Bran breakfast bars. Was there any info about a release date with the samples? They killed their previous 20% bars over a year ago and have listed the new 40% Strawberry and Apple Streusel flavors on their webpage for months without them being available in stores. I don't usually have time for bran cereal in the morning and oat-based high fiber bars don't really agree with my digestive system, so I need these bran bars!